For the 1910s coach, see Fred Robbins (American football coach). For the American radio and television personality, see Fred Robbins (broadcaster). Fred Robbins (born March 25, 1977) is a former American football defensive tackle. He was drafted by the Minnesota Vikings in the second round of the 2000 NFL Draft. He played college football at Wake Forest. Robbins also played for the New York Giants and St. Louis Rams. Robbins attended J. M. Tate High School in Pensacola, Florida and was a student and a letterman in football and baseball. In football, he was a three-year letterman and as a senior, he was an All-City selection and an All-Northwest Florida selection. Robbins started every game for three years at defensive tackle and finished his career with 15 quarterback sacks and 44 tackles-for-loss. He was a Second-team All-ACC choice as a senior. He helped the Demon Deacons’ defense improve from 9th to 2nd in the ACC in 1999. Robbins was drafted on the second round of the 2000 NFL Draft by the Minnesota Vikings. He signed a four-year $5.5 million deal with the Vikings. As a rookie in 2000, played in 8 games as a reserve and had 5 tackles and one sack. In 2001, played in 16 games with 12 starts and had 45 tackles (16 solo) and 2 sacks. In 2002, played in 16 games with 15 starts for the Vikings and recorded 41 tackles (23 solo). Robbins led the team with 7 tackles for loss and had a career-high 4 passes defensed. In 2003, he played in all 16 games with 12 starts for the Vikings and finished with 30 tackles, 5 tackles for loss, and 5 quarterback hurries and recovered one fumble. On March 7, 2004, Robbins signed with the New York Giants for six years and $20 million, including a $4 million bonus. In his first season with the Giants in 2004, he started all 15 games and recorded 40 tackles (31 solo), 5 sacks, 1 interception, 2 passes defensed and 2 forced fumble. In 2005, played in all 16 regular season games with 6 starts at defensive tackle and finished the season with 23 tackles (14 solo), 1.5 sacks, 1 pass defensed and 1 fumble recovery. In 2006, Robbins started all 16 regular season games and the NFC Wild Card Game and finished with career-high totals of 62 tackles (39 solo), 5.5 sacks, 2 interceptions and 34 quarterback hurries. In 2007, he played in 16 regular season with 15 starts and started all 4 postseason games and finished with 42 tackles (21 solo), 5.5 sacks, 26 QB hurries, 10 QB hits and 1 pass defensed. Robbins was also picked by his teammates to be a defensive captain for the 2008 season. In 2008, he started in all 14 regular season games in which he played and had 36 tackles (24 solo), 5.5 sacks and 3 passes defensed. It was the 3rd consecutive season he finished with 5.5 sacks, his career high. He was named to the 2008 Sports Illustrated All-Pro team. 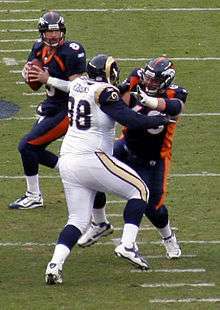 Robbins had microfracture surgery following the 2008 season, and managed just two sacks in 16 games in 2009. Robbins taking on guard Zane Beadles en route to pressuring Kyle Orton on 11-28-2010. Robbins signed a three-year $11.3 million contract with the St. Louis Rams. The deal included a roster bonus of $3.4 million. He was released following the 2011 season on March 12, 2012. ↑ "Russell Maryland". ESPN Internet Ventures. Retrieved 4 June 2014.